The Daylite Server plugin monitors server availability and backup status for Daylite Server version 3 and above. Assume that Daylite Server backups are located in the default folder. Only the single most recently updated Daylite database is monitored by default. Set the warning threshold based on the number of allowed days between backups, as defined by the Daylite Server. The plugin will then trigger a warning email to alert you of these assumptions, and suggest that they be reviewed. Confirm that the correct backup folder is selected. 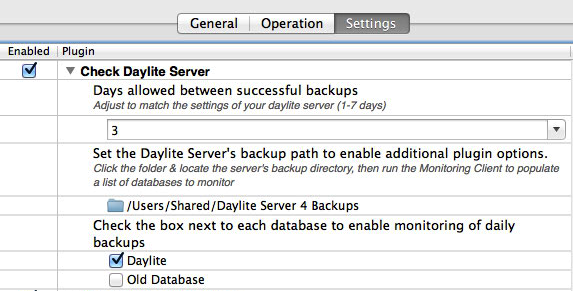 Select from the available Daylite database backups, to ensure each important database is being monitored. Confirm the number of days allowed between backups, before Watchman Monitoring sends an alert. Upgrading Daylite server does not, by default, change the path to the backups. If you started with backups in /Users/Shared/Daylite Server (4) Backups. the plugin will assume that the backups stay in that folder. If you choose to relocate the path to your Daylite Server Backups without updating the path to the backups in the PreferencePane, the plugin will begin to alert you that backups are not completing as expected. Use the PreferencePane to select the new backup location.